← Only slightly less acceptable in polite society than the “F” word, is the word “sin.”After the very vocal rebellion following the promulgation of Humanae Vitae, the silence on doctrine began. And so we come to the proximate root of this scandal: the cover-up of the doctrine of sin. The word “sin” began almost to disappear from preaching in the aftermath of Vatican II. Sin – as a separation from God and an offense against Him, as a turning away from God and a fixation on creatures – was ignored. The extraordinary gap left by the neglect of the doctrine of sin was now filled with psychological assessments of a multifaceted condition of weakness in man. Spiritual theology was replaced with the reading of Freud and Jung, the true masters in many seminaries. Sin became irrelevant, while self-esteem and the overcoming of all taboo, especially in the sexual sphere, were the new ecclesial passwords. The red string bracelet is a very common talisman in witchcraft/Wicca and Kabbalah, which is basically a hybrid of Talmudic Judaism and witchcraft. 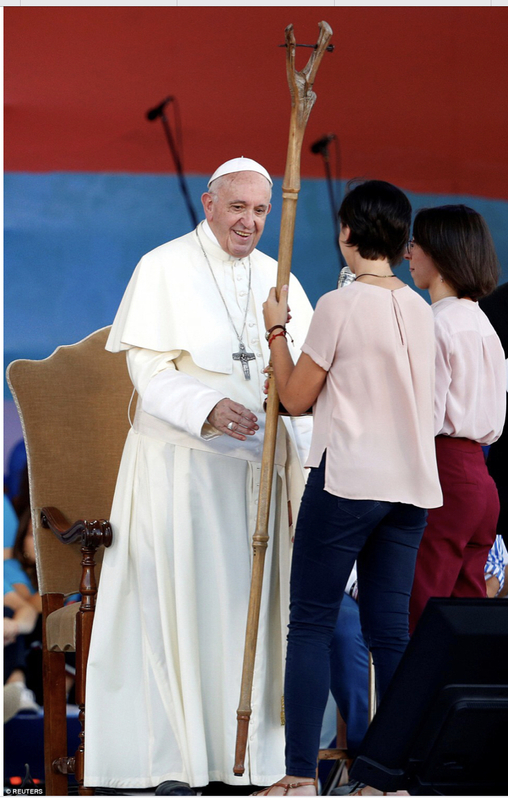 Here in the picture of Antipope Bergoglio being presented with the Stang he carried yesterday by two females at a “youth rally” at the Circus Maximus in Rome in August, you can clearly see the woman on the left, holding the Stang, is wearing the knotted red thread talisman bracelet. Citations on this are practically endless. This entry was posted in Uncategorized on October 5, ARSH 2018 by Ann Barnhardt. Perhaps in order to approach the Mystery, we should only look at one aspect of it in this post. 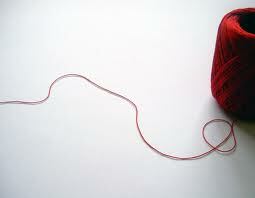 The Red Thread and the Initiatory Process. The “Red Thread” is the moniker we use to refer to the line of Witch Blood that connects us to Tubal Qayin. A few of us come to this Tradition with ties to Qayin, bonds or possibly even Witch Marks that we reinforce through charms or the process of admission into a curveen. Many create that link through specific ritual. Our system of admission is actually quite simple. We have a beginning level which we call Greening. I’ll reserve full discussion of this level for another post, but I’ll say here that this is the level for “children” within this path — whether literal or figurative. Next is Adoption, and it is at this time when the Red Thread is linked. This Tradition is linked very intimately to flow and nature of the family, so the Adoption corresponds to the time of puberty. When a child has come into physical, mental and emotional maturity sufficient for the study of basic magic, she may be brought into her Craft family. When a Seeker, regardless of physical age, has passed the period of initial giddiness and done some serious work and review of his aims as a Witch, he too is eligible for adoption into the Craft family. This rite can happen at any of the Gates or Castles. In other words, it can happen at any Sabbat. During the course of the ritual, the candidate is challenged and queried by the curveen members. Provided that she meets with approval at the end of all challenges, she will take blood oath on the anvil. There are two points to make note of here: 1) participation in the ritual doesn’t guarantee success; and 2) the anvil is the “oath stone” of the Tradition and is intimately linked in symbolic terms to Tubal Qayin. Have wondered how any one of the adulterers and misleaders in the hierarchy have escaped what Judge K experienced and concluded that they will not in God’s justice.